What is a SAP HANA push down in the context of BW transformations? When does a push down occur? What are the prerequisites for forcing a SAP HANA push down? Before I start to explain how a SAP HANA based BW transformation could be created and what prerequisites are necessary to force a push down I will provide some background information on the differences between an ABAP and SAP HANA executed BW transformation. A HANA based BW transformation executes the data transformation logic inside the SAP HANA database. Figure 1.1 shows on the left-hand side the processing steps for an ABAP based transformation and on the right-hand side for a SAP HANA based transformation. This blog provides information on the push-down feature for transformations in SAP BW powered by SAP HANA. The content here is based on experiences with real customer issues. The material used is partly taken from the upcoming version of the SAP education course PDEBWP – BW Backend und Programming. This blog is planned as part of a blog series which shares experiences collected while working on customer issues. The listed explanations are primarily based on releases between BW 7.40 SP09 and BW 7.5 SP00. A HANA based BW transformation is a “normal” BW transformation. The new feature is that the transformation logic is executed inside the SAP HANA database. From a design time perspective, in the Administrator Workbench, there is no difference between a HANA based BW transformation and a BW transformation that is executed in the ABAP stack. By default the BW runtime tries to push down all transformations to SAP HANA. Be aware that there are some restrictions which prevent a push down. 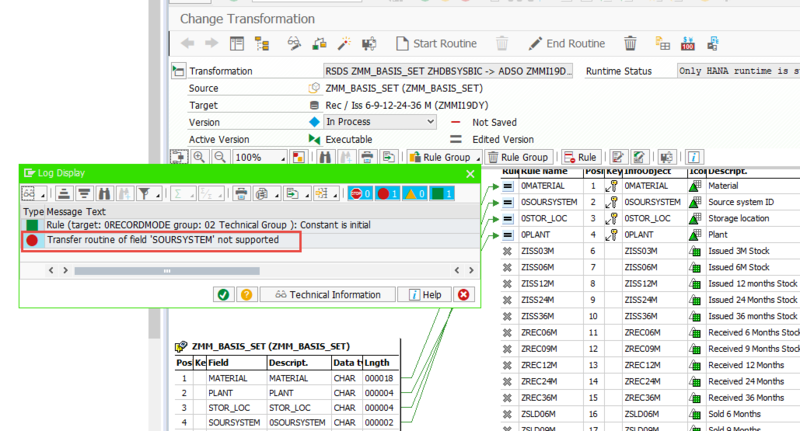 For example a push-down to the database (SAP HANA) is not possible if a BW transformation contains one or more ABAP routines (Start-, End-, Expert- or Field-Routine). For more information see Transformations in SAP HANA Database. Further restrictions are listed in the Help Portal. However, the documentation is not all-inclusive. Some restrictions related to complex and “hidden” features in a BW transformation are not listed in the documentation. In this context “hidden” means that the real reason is not directly visible inside the BW transformation. The BAdI RSAR_CONNECTOR is a good example for such a “hidden” feature. A transformation using a customer specific formula implementation based on this BAdI cannot be pushed down. In this case the processing mode is switched to ABAP automatically. The BW workbench offers a check button in the BW transformation UI to check if the BW transformation is “SAP HANA executable” or not. The check will provide a list of the features used in the BW transformation which prevent a push down. SAP is constantly improving the push down capability by eliminating more and more restrictions In order to implement complex customer specific logic inside a BW transformation it is possible to create SAP HANA Expert Script based BW transformations. This feature is similar to the ABAP based Expert-Routine and allows customers to implement their own transformation logic in SQL Script. A detailed description of this feature is included later on. SAP Note 2057542 – Recommendation: Usage of HANA-based Transformations provides some basic information and recommendations regarding the usage of SQL Script inside BW transformations. An ABAP based BW transformation loads the data package by package from the source database objects into the memory of the Application Server (ABAP) for further processing. The BW transformation logic is executed inside the Application Server (ABAP) and the transformed data packages are shipped back to the Database Server. The Database Server writes the resulting data packages into the target database object. Therefore, the data is transmitted twice between database and application server. During processing of an ABAP based BW transformation, the source data package is processed row by row (row-based). 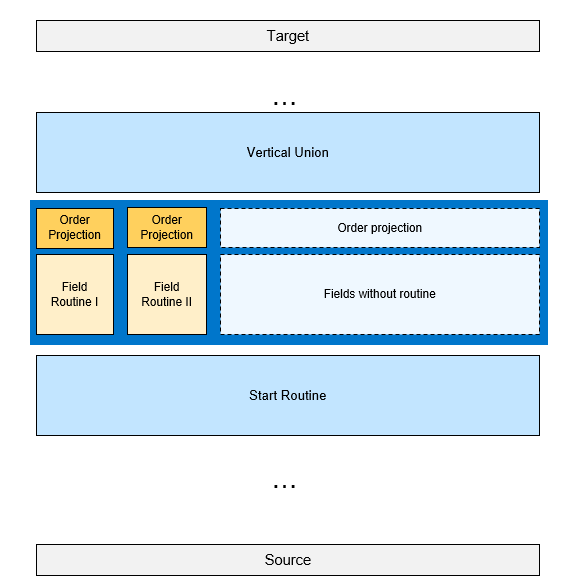 The ABAP based processing allows to define field-based rules, which are processed as sequential processing steps. For the HANA based BW transformation the entire transformation logic is transformed into a CalculationScenario (CalcScenario). From a technical perspective the Metadata for the CalcScenario are stored as a SAP HANA Transformation in BW (see transaction RSDHATR). This CalcScenario is embedded into a ColumnView. 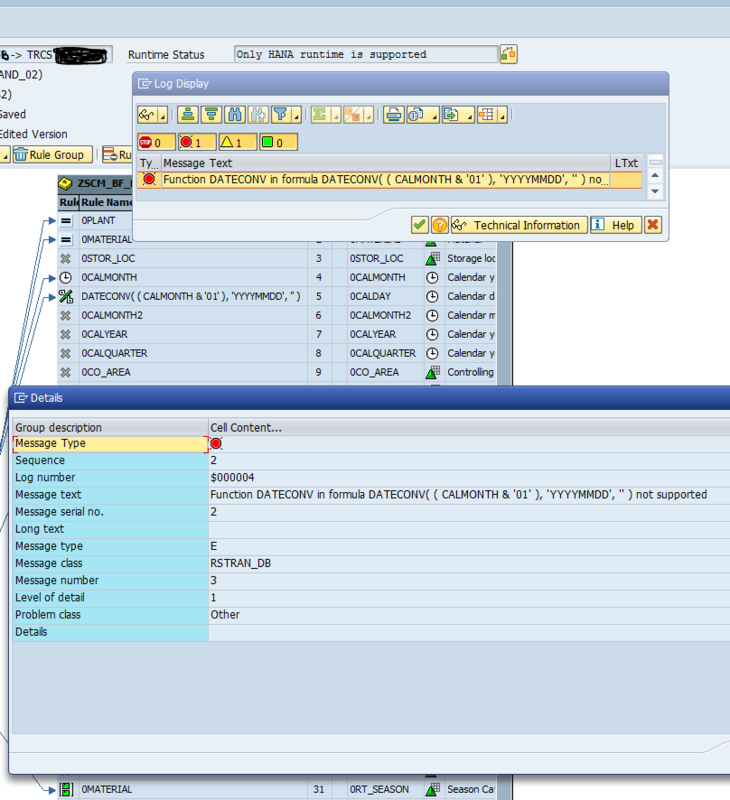 To select data from the source object, the DTP creates a SQL SELECT statement based on this ColumnView (see blog »HANA based BW Transformation – Analyzing and debugging«) and the processing logic of the CalcScenario applies all transformation rules (defined in the BW transformation) to the selected source data. By shifting the transformation logic into the CalcScenario, the data can be transferred directly from the source object to the target object within a single processing step. Technically this is implemented as an INSERT AS SELECT statement that reads from the ColumnView and inserts into the target database object of the BW transformation. This eliminates the data transfer between Database Server and Application Server (ABAP). The complete processing takes place in SAP HANA. A standard SAP HANA executable BW transformation is a BW transformation without SAP HANA specific implementation, which forces a SAP HANA execution. The BW Workbench tries to push down new BW transformations by default. The activation process checks a BW transformation for unsupported push down features such as ABAP routines. For a detailed list of restrictions see SAP Help –Transformations in SAP HANA Database. If none of these features are used in a BW transformation, the activation process will mark the BW transformation as SAP HANA Execution Possible see (1) in Figure 1.2. When a BW transformation can be pushed down, the activation process generates all necessary SAP HANA runtime objects. 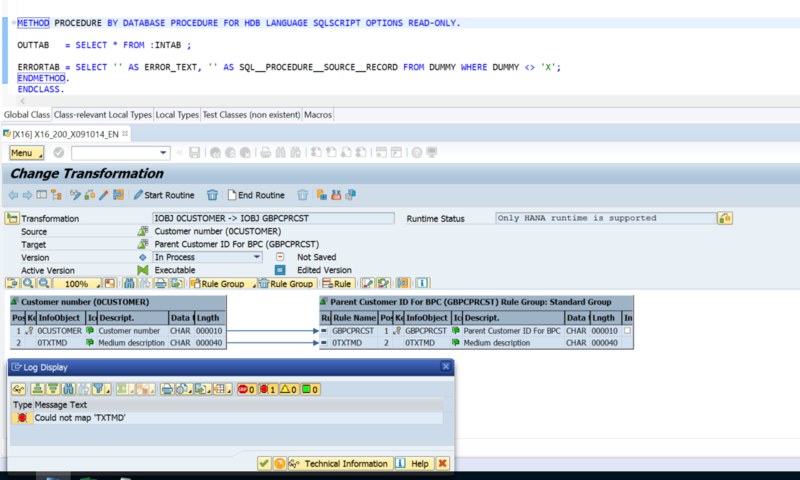 The required metadata is also assembled in a SAP HANA Transformation (see Transaction RSDHATR). The related SAP HANA Transformation for a BW transformation can be found in menu Extras => Display Generated HANA Transformation, see (2) in Figure 1.2. From a technical perspective a SAP HANA Transformation is a SAP HANA Analysis Process (see Transaction RSDHAAP) with a strict naming convention. The naming convention for a SAP HANA Transformation is TR_<< Program ID for Transformation (Generated)>>, see (3) in Figure 1.2. A SAP HANA Transformation is only a runtime object which cannot not been explicit created or modified. The tab CalculationScenario is only visible if the Export Mode (Extras => Export Mode On/Off) is switched on. The tab shows the technical definition of the corresponding CalculationScenario which includes the transformation logic and the SQLScript procedure (if the BW transformation is based on a SAP HANA Expert Script). If the transformation is marked as SAP HANA Execution Possible, see (1) in Figure 1.2 the first precondition is given to push down and execute the BW transformation inside the database (SAP HANA). That means if the flag SAP HANA Execution Possible is set the BW transformation is able to execute in both modes (ABAP and HANA) and the real used processing mode is set inside the DTP. To be prepared for both processing modes the BW transformation framework generates the runtime objects for both modes. Therefore the Generated Program (see Extras => Display Generated Program) for the ABAP processing will also be visible. The next step is to create the corresponding DTP, see paragraph 1.2.4 »Create a Data Transfer Process (DTP) to execute the BW transformation in SAP HANA«. If the business requirement is more complex and it is not possible to implement these requirements with the standard BW transformation feature, it is possible to create a SQLScript procedure (SAP HANA Expert Script). When using a SAP HANA Expert Script to implement the business requirements the BW framework pushes the transformation logic down to the database. Be aware that there is no option to execute a BW transformation with a SAP HANA Expert Script in the processing mode ABAP, only processing mode HANA applies. From the BW modelling perspective a SAP HANA Expert Script is very similar to an ABAP Expert Routine. The SAP HANA Expert Script replaces the entire BW transformation logic. The SAP HANA Expert Script has two parameters, one importing (inTab) and one exporting (outTab) parameter. The importing parameter provides the source data package and the exporting parameter is used to return the result data package. However, there are differences from the perspective of implementation between ABAP and SQLScript. An ABAP processed transformation loops over the source data and processes them row by row. 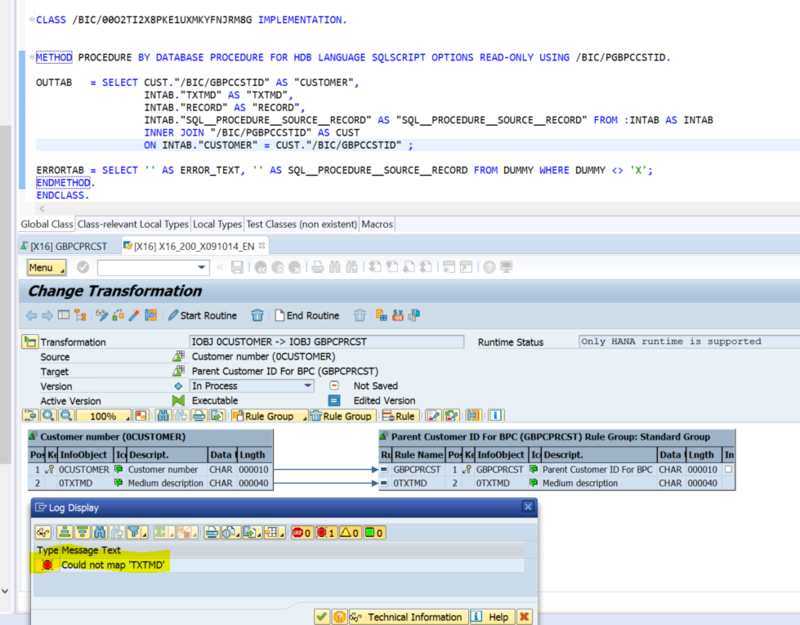 A SAP HANA Expert Script based transformation tries to processes the data in one block (INSERT AS SELECT). To get the best performance benefit of the push down it is recommended to use declarative SQLScript Logic to implement your business logic within the SAP HANA Expert Script, see blog »General recommendations«. Development support features such as syntax highlighting, forward navigation based on error messages, debugging support, etc. is better in the ABAP development environment. From the technical perspective the SAP HANA Expert Script is a SAP HANA database procedure. From the BW developer perspective the SAP HANA Expert Script is a SAP HANA database procedure implemented as a method in an AMDP (ABAP Managed Database Procedure) class. The AMDP class is be generated by the BW framework and can only be modified within the ABAP Development Tools for SAP NetWeaver (ADT), see https://tools.hana.ondemand.com/#abap. The generated AMDP class cannot not be modified in the SAP GUI like Class editor (SE24) or the ABAP Workbench (SE80). Therefore it is recommended to implement the entire dataflow in the Modeling Tools for SAP BW powered by SAP HANA, see https://tools.hana.ondemand.com/#bw. The BW transformation itself must still be implemented in the Data Warehousing Workbench (RSA1). Next I’ll give a step by step introduction to create a BW transformation with a SAP HANA Expert Script. Now we must switch into the BW Modeling Perspective. To open the BW Modeling Perspective go to Window => Other .. and select in the upcoming dialog the BW Modeling Perspective, see Figure 1.3. To open the embedded SAP GUI a BW Project is needed. It is necessary to create the BW Project before calling the SAP GUI. To create a new BW Project open File => New => BW Project. To create a BW Project a SAP Logon Connection is required, choose the SAP Logon connection and use the Next button to enter your user logon data. I normally add at the end a postfix for the project type such as _BW for the BW Project. For an ABAP project later on I will use the postfix _ABAP. The reason I do that is both projects are using the same symbol in the project viewer and the used postfix makes it easier to identify the right project. Once the BW Project is created we can open the embedded SAP GUI. The BW Modeling perspective toolbar provides a button to open the embedded SAP GUI, see Figure 1.4. Choose the created BW Project in the upcoming dialog. Next start the BW Workbench (RSA1) within the embedded SAP GUI and create the BW transformation or switch into the edit mode for an existing one. To create a SAP HANA Expert Script open Edit => Routines => SAP HANA Expert Script Create in the menu of the BW transformation. Confirm the request to delete the existing transformation logic. Keep in mind that all implemented stuff like Start- End- or Field-Routines and formulas will be deleted if you confirm to create a SAP HANA Expert Script. In the next step the BW framework opens the AMDP class by calling the ABAP Development Tools for SAP NetWeaver (ADT). For this an ABAP project is needed. Select an existing ABAP Project or create a new one in the dialog. A new window with the AMD class will appear. Sometimes it is necessary to reload the AMDP class by pressing F5. Enter your credentials if prompted. The newly generated AMDP class, see Figure 1.5, cannot not directly be activated. Before I explain the elements of the AMDP class and the method I will finalize the transformation with a simple valid SQL statement. The used SQL statement, as shown in Figure 1.6, is a simple 1:1 transformation and is only used as an example to explain the technical behavior. Now we can activate the AMDP class and go back to the BW transformation by closing the AMDP class window. Now it is necessary to activate the BW transformation also. For a BW transformation with a SAP HANA Expert Script the flag SAP HANA Execution possible is set, see Figure 1.7. As explained before, if you use a SAP HANA Expert Script the BW transformation can only been processed in SAP HANA. It is not possible to execute the transformation on the ABAP stack. Therefore the generated ABAP program (Extras => Display Generated Program) is not available for a BW transformation with the processing type SAP HANA Expert Script. Within the BW transformation the flag Sorting after call of expert script, see Figure 1.8, (Edit => Sorting after call of expert script) can be used to ensure that the data is written in the correct order to the target. If the data is extracted by delta processing the sort order of the data could be important (depending on the type of the used delta process). By default, the flag is always set for all new transformations and it’s recommended to leave it unchanged. For older transformations, created with a release before 7.40 SP12, the flag is not set by default. So the customer can set the flag if they need the data in a specific sort order. The inTab and the outTab structure of a SAP HANA Expert Script will be enhanced by the field RECORD if the flag is set. The added field RECORD is a combination of the fields REQUESTSID, DATAPAKID and RECORD from the source object of the transformation, see Figure 1.9. The RECORD field from the outTab structure is mapped to the internal field #SOURCE#.1.RECORD. Later on in a rownum node of the CalculationScenario the result data will be sorted by the new internal field #SOURCE#.1.RECORD, see Figure 1.10. This declaration specifies the method to the HANA database (HDB), the language to SQLSCRIPT and further on defines that the database procedure is READ ONLY. The read only option means that the method / procedure must be side-effect free. Side-effect free means that only SQL elements (DML) could be used to read data. Elements like DELETE, UPDATE, INSERT used on persistent database objects are not allowed. These data modification statements can also not be encapsulated in a further procedure. You cannot directly read data from a database object managed by ABAP like a table, view or procedure inside an AMDP procedure, see (1) in Figure 1.12. A database object managed by ABAP has to be declared before they can used inside an AMDP procedure, see (2). For more information about the USING option see AMDP – Methods in the ABAP documentation. The AMDP framework generates wrapper objects for the declared database object managed by ABAP . The view /BIC/5MDEH7I6TAI98T0GHIE3P69D1=>/BIC/ATK_RAWMAT2#covw in (3) was generated for the declared table /BIC/ATK_RAWMAT2 in (2). The blog Under the HANA hood of an ABAP Managed Database Procedure provides some further background information about AMDP processing and which objects are generated. Only the method implementation belongs to the BW transformation Meta data and only this part of the AMDP class would been stored, see table RSTRANSCRIPT. Currently the ABAP Development Tools for SAP NetWeaver (ADT) does not protect the source code which should not been modified, like in an ABAP routine. That means all modifications in the AMDP class outside the method implementation will not be transported to the next system and will be overwritten by the next activation process. The BW transformation framework regenerates the AMDP class during the activation process. All tables and views from the local SAP schema must be declared in the USING clause and must be defined in the ABAP DDIC. It is possible to read data from other schema without a declaration in the USING clause. If a table or view in the local SAP schema starts with the prefix /1BCAMDP/ it is not necessary to declare the table/view in the USING clause. Until version BW 7.50 SP04 the AMDP class name is generated based on the field RSTRAN-TRANPROG. From BW 7.50 SP04 the field RSTRAN-EXPERT is used to generate the AMDP class name. The metadata storage for the AMDP routines was adjusted to align the AMDP metadata storage analogous to the ABAP metadata. The push down option is not restricted on data flows with one BW transformation. It is also possible to push down a complete data flow with several included BW transformations (called stacked data flow). To get the best performance benefits from the push down it is recommended to stack a data flow by a maximum of three BW transformations. More are possible but not recommended. The used InfoSources (see SAP Help: InfoSource and Recommendations for Using InfoSources) in a stacked data flow can be used to aggregate data within the data flow if the processing mode is set to ABAP. If the processing mode set to SAP HANA the data will not be aggregated as set in the InfoSource settings. The transformation itself does not know the processing mode, therefore you will not get a message about the InfoSource aggregation behavior. The used processing mode is set in the used DTP. That means, the BW transformation framework prepares the BW transformation for both processing modes (ABAP and HANA). During the preparation the framework will not throw a warning regarding the lack of aggregation in the processing mode HANA. The corresponding CalculationScenario for a BW transformation is not available if the source object is an InfoSource. That means the tab CalculationScenario is not available in the export mode of the SAP HANA transformation, see Extras => Display Generated HANA Transformation. The source object for this CalculationScenario is an InfoSource and an InfoSource cannot be used as data source object in a CalculationScenario. The related CalculationScenario can only be obtain by using the SAP HANA Transformation from the corresponding DTP. I’ll explain this behavior later on in the blog »HANA based Transformation (deep dive)«. the DTP does not use any options which prevent a push down. The DTP UI provides a check button, like the BW transformation UI, to validate a DTP for HANA push down. In case a DTP is not able to push down the data flow (all involved BW transformations) logic, the check button will provide the reason. In the simple transformation sample above I’m using one BW transformation to connect a persistent source object (DataSource (RSDS)) with a persistent target object (Standard DataStore Object (ODSO)). We also call this type a non-stacked dataflow – I’ll provide more information about non-stacked and stacked data flows later. The related SAP HANA Transformation for a DTP can be found in menu Extras => Display Generated HANA Transformation, see (2) in Figure 1.14. In case of a non-stacked data flow the DTP uses the SAP HANA Transformation of the BW transformation, see (3) in Figure 1.14. The usage of a filter in the DTP does not prevent the HANA push down. ABAP Routines or BEx Variables can be used as well. The filter value(s) is calculated in a pre-step and added to the SQL SELECT statement which reads the data from the source object. We will look into this later in more detail. From the execution perspective, regarding the handling, a HANA based transformation behaves comparable to an ABAP based transformation, simply press the ‘Execute’ button or execute the DTP form a process chain. Later on I will provide more information about packaging and parallel processing. There is no option to execute a transformation with a SAP HANA Script on the ABAP application server. With BW 7.50 SP04 (the next feature pack) it is planned to deliver further option to use SAP HANA Scripts (Start-, End- and Field-Routines are planned) within a BW transformation. Further information about supported SAP HANA execution feature are provided in the SAP note: 2329819 – SAP HANA execution in DTPs (Data Transfer Processes) – Optimizations. Hi Torsten, thanks for blog – we were working on BW 7.5 SP2 HANA project & for one of requirement we need to delete some data coming in from source ERP to BW. like in BW we would normally use start routine to delete unwanted records but here as we know processing at HANA DB will not be supported when we use Start routine. I want to delete all records from source where field X is blank. If this is possible then can you advise syntax pls as when I was trying to use DELETE in procedure it was giving error. Hence appreciate your quick response. SQLScript Start-, End- and Field routines are planned for SP04. But to delete (do not further process) specific rows you can filter the inTab. Here you must explicit map the fields from the inTab to the field from the outTab! to enable the optimizer to get the best runtime performance. I’ll provide more information about recommendation in one of the next upcoming blogs (General recommendation). What could be the reason that I can’t see the generated procedure in Figure 1.12 ? Also, I try to map a sample field with a lookup. How should be the whole sytax? I’m working on a BW 7.4 SP14 and HANA 1.00.112.01 system. You mean, you had created a transformation with a SAP HANA Expert Script and activated the AMDP class and the database procedure <<CLASS-NAME>>=>PROCEDURE is not in the folder PROCEDURE in the schema SAP<SID>? In that case you can first try to activate the transformation. Is the DB procedure still not there. Open the report RSDBGEN_AMDP enter your class name and choose the option “Create database objects”. But option two should not be necessary. To read from a DataStore object (advanced), the system first provides you with a proposal for how the fields can be assigned. The key fields must be assigned to the source fields of the transformation. When assigning the fields, the names do not need to be identical. In case the standard rules doesn’t fit you can read (join) the data from a table with the source data (inTab). The following sample explains how I read the field TK_VENDOR form the table /BIC/ATK_RAWMAT1 and add it to the outTab. To do that I JOIN the inTab with the table /BIC/ATK_RAWMAT1. Thanks for the detailled explanation. The part “#covw” seems to be a generated suffix, right? Is it generated once “USING ZTABLE” is added and acivated within the script? If so, that’s something I couldn’t find. I will try the standard option as long as possible. is a view (not a procedure) and could be find in the folder view (not column view). We are currently facing the issue with filtering incoming data by dtp filters. Maybe you can provide some additional sources to look up on this topics? In one of my next blogs (general recommendations)I will provide a sample where I use a CaclView with an input variable. The CalcView is part of a CompositeProvider and the CompositeProvider is a source of a transformation. I’ll show in case the input parameter is mandatory that the DTP filter is also mandatory. Sorry but I have no further source material to provide. May be you can explain your issue in more details or in case of an error create an incident. I’ve open discussion Input parameters in HANA DTPs from Composite Provider, Virtual Provider on HANA Views. Error occurs when I try to check HANA Execution in DTP parameters. Very good blog, thank you! I see in your example that you refer to the active table if you need to read data from another ADSO in your SQL script. (example: SELECT * FROM “system-local.bw.bw2hana::DADSO1”). What is your idea about using SQL script in BW and NLS? – do you want to read data from a NLS located object inside the SQL script? I meant reading data from a NLS located object inside the SQL script. Okay, I’ll check this and come back to you. Because of years end it could take some days. In the meantime we use the ‘External SAP HANA view’ of an ADSO in a lot of our HANA Expert scripts to SELECT or JOIN. This works perfectly. We recently tried to upgrade from 7.5SP3 to 7.5SP7 and we encountered performances issues in some SQL statements that are using these views. In most cases but we have solved the issue by reactiving the ADSO (it regenerates the HANA view) but not all cases are solved. Do you advice we use these ‘External SAP HANA view’ in HANA Expert scripts? first please ensure that all notes are implemented after the upgrade. I’d added some new notes today. Regarding the external view’s, it is not so easy to provide a general recommendation. I’ll check if it be possible provide a recommendation here and will come back. I’d discussed the topic internally and up to now we can say their is now way that we can recommend. That means We can not recommend to use external views neither we can recommend to read data direct from the active BW object table. But that does not mean that we forbid the use. What we recommend try to implement the transformation logic by using standard rule types (read from ADSO, read Masterdata, Formula, …). Sometimes it is necessary to split the logic of a routine in several standard rules (used in a stacked data flow) to obtain the same logic as in the routine . For BW/4 HANA (SP07) we’re planing to provide a new stable view which can be used in the staging context. I am wondering if you can provide us some sample code for reading a inTab into temporary table and another dso table from BW into another temporary table with lookup using ABAP temporary work area structure and updating using loop functions to get the final result. Sorry for asking help in this kind of coding. Any help on sample typos to follow in AMDP SQL script? such as how we used to write expert ABAP routines as below. Loop at SOURCE_PACKAGE into workarea_source_package. with key key = workarea_source_package. like we are typical using in ABAP. In a SQL Script routine (or AMDP routine) the parameter inTab is the same as the SOURCE_PACKAGE in the ABAP routine. Now you can create a UNION or a JOIN based on both tmp table. It is also possible to join or union the inTab directly with a database table. But keep in mind, if you create to complex statements it is sometime hard to read and understand the coding if you search for an error or if you searching the reason for erroneous data. Otherwise, compiling the whole logic in one complex statement can increase the runtmie. So the goal is to find a way in between, a good runtime and coding that can be maintained. We have several hierarchies coming from several sources. I have planned to load them using BODS into BW PSA and then to aDSO with out any transformations. From there we are again loading into another aDSO from flattening it however the data is not as straight as other transformation for lookups. Now I am trying to transform the data and flatten it from making the tail end level 8 code being the key in aDSO. from here I am stuck how to prepare the result data flattened without loops. Sorry for asking such a deep dive cause I am stuck at this where I have written most of the in ABAP expert routines to move the project. Any help? you can use all SQL Script feature. It is also possible to use loops and conditions. otherwise you can implement it in a same way as in ABAP. As explained in the blog, if you are using declarative programming logic it will be translated into L (L-Pop). And this CAN (not must) blog the optimizer! The general declaration form the development is: “It is implausible that a L-Pop is faster than a pure SQL statement!”. I have figured it out and written the AMDP script in SQL using unions and joins but very clumsy. I have been doing lot of ABAP and converting that into HANA AMDP SQL script is not that straight forward but made me think a lot. I have finally written and tested the transformation and data successfully but I couldn’t find difference in performance from BW routine world to HANA AMDP world. Or may be due to less volume of data. However its more interesting and challenging to learn new coding techniques. I went through HANA sql guide and writtent line by line for 3 days to finish it. is there any news regarding the new version of the PDEBWP course you mentioned? Or is it already available and I couldn’t find it? And the idea is to cover BW/4 topics as well in the new version. May be in the middle of the year but no promise on that. no worries. Just wanted to ask, if it’s still on the table. It is a very informative blog. I got a lot of information from here. Is it also possible to include custom R-Code in the SQLScript ? from the BW side we had no restriction on that. But I’d never tested that. if you say “include”, I assume you wants to call a procedure which is implemented in R, right? METHOD GLOBAL_EXPERT BY DATABASE PROCEDURE FOR HDB LANGUAGE SQLSCRIPT OPTIONS READ–ONLY. METHOD GLOBAL_EXPERT BY DATABASE PROCEDURE FOR HDB LANGUAGE R-SCRIPT OPTIONS READ–ONLY. The second one is currently not possible. But we can talk about. Can you provided a use case? Transformation must not be executed on HANA. Is it an issue with BW7.5 SP5 or the way on how we are handling the hierarchies?. I thought to check with you before i raise to SAP as it looks like an issue with Hierarchies. the message only means that you can not execute the transformation in the processing mode HANA. But you can use the processing mode ABAP instead. How to i enabled the ABAP processing mode?. I dono’t see that option in embedded BW in DTP settings. Please let me know if i works differently. in the right upper corner should be a checkbox with the label “SAP HANA Execute”. 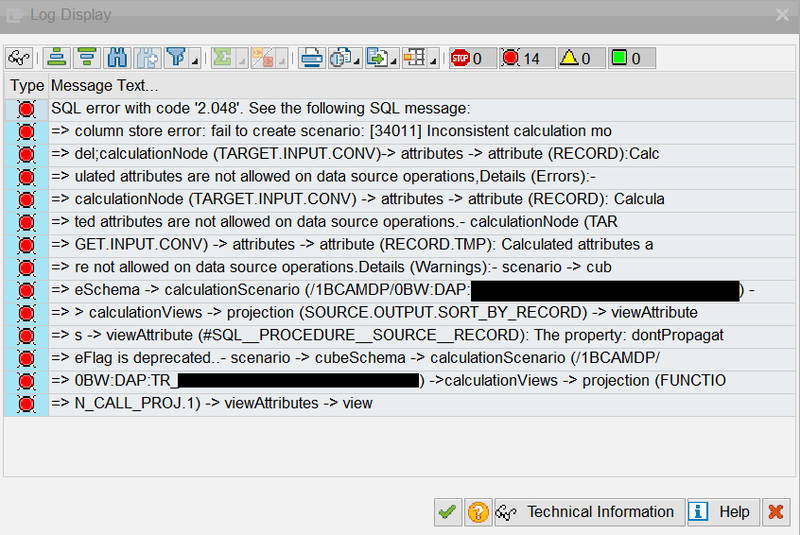 If the checkbox is marked than the DTP is running in the HANA processing mode. If you remove the marker from the checkbox the DTP is executed in the ABAP mode. If the DTP runs in delta process and the init is already been processed it could be that you can not change the processing mode. In that case it is necessary to empty the target first. Thanks Torsten. That will be usual case in BW modeling but embedded BW is working strange. I have the checkmark disabled( not selected). It looks like we cannot load hierarchies manually in BW7.5 SP5( only Remote Hier Class with Hier Class Parameters:CL_FCOM_IP_HRY_READER_GLACCT). Did you had a chance of using the SAP Function modules in your SQL scripts. I am trying to convert lot of my transformations into AMDP, but I don’t know how to handle the FM’s. It makes also no sense . The main purpose to push down the transformation processing is to prevent the data transfer. In case of using FM in SQL script the data must be transfer from the database to the application server for processing in the FM. Keep in mind, it is not necessary to migrate existing transformation soon. The ABAP runtime is still available. Thanks for the blog. One question though. If I have global declarative section in my original ABAP with an internal table which is shared between Start and End Routines, How can I have similar data sharing between AMDP based Start and End Routines? OUTTAB provides for the dataset being processed but I have another global table that is used in the end routine for additional processing. that is not possible. The AMDP methods are declared as READ-ONLY to ensure that the coding is side-effect-free. That means you can not use temporary table or session variables to share data along database procedures. Your sample with certain customer in earlier packages sounds like a semantic group issue. I’m not sure which release you are using but with BW4/HANA (I belive started with SP04) semantic groups does no longer prevent a push down. Further on, please do not try to translate all ABAP based transformation as a one-to-one copy into a SQL Script (AMDP) based transformation. The processing logic between ABAP and SQL Script is difference. Please see paragraph 1.1 in this blog. We provide a toolbox with a lot of standard transformation rules and the option to use ABAP and/or SQL Script in case the standard rules are not enough. Its up to you to pick the right option to implement the business logic. Thanks for the nice blog. You blog encouraged me to write try AMDP script. We have been recently upgraded to 7.5 SP5. When I tried to test a simple logic following your blog, I ran into an issue. Code was activated without any errors but when I tried to activate transformation, its giving an error that text field cannot be mapped (first snapshot attached). I deleted all my logic and added simple select from intab (second snapshot). Even then I see the error. If I delete start routine and mapped fields directly, transformation gets activated without any issues. I could not find any note on market place. I am not sure if I am doing anything wrong or its a bug. Your feedback is appreciated. for the topic BW transformation with HANA push down we do not create separate notes for each issue. We are putting the fixes in collection notes for each SP. I’d written a special blog where you can find all relevant notes. Please check which notes are relevant for your release / SP and implement them in the latest version! If all notes are on the current version, please try again. How is this situaion supposed to be handled with AMDP – since the auto-generated AMBD’s for Start and Field rutines are separate Classes? You cannot hand over this type of programming logic from ABAP to HANA (AMDP). In the HANA processing mode, we are working on package level on not like in ABAP on row level. That means if you create an AMDP field routine all the importing parameter inTab handover all values of the source package. And the better way here is to use join operation to enrich your data. Up to now a field routine has one target field (except a key figure with a unit). Field routines with more than one target fields are under investigation but only for BW/4. Please keep in mind that field routines are HANA internally could be processed in parallel. The picture below shows the potential parallel processes in the blue background rectangle. I need to sort the Source Package by certain fields and need to delete the adjacent duplicates from the Source_Package, Can you please guide me how to do that in AMDP? in some cases the sort order is important to write the data in the right order into the target and you can not / should not change the order. Reason for that are key figure aggregation- and delta-handling. Than your further processing within the start routine must base on inTabClered. In case that’s all what you wants to do in the routine you can directly write the result from the SELECT into the outTab. But please keep an eye on your key figure aggregation behavior. Thank you Torsten for your detailed explanation. Appreciate it. many thanks for your great support in the whole topic. I’d like to ask how can I force the system where to process? In HANA (push down) vs. ABAP? Because I face an issue with a transformation if I want to use “Read Master Data” for one field and for a second field a formula say with “DATECONV”. This can not be combined at all because “Read Master Data” forces the processing in HANA. So I face the problem that DATECONV does not just prevent the push down, it prevents everything at all. Is this a feature or does it sound like a bug? which release/SP you are running? please ensure that all relevant notes (see my note related blog) are implemented in the latest version. nope, not all notes has been applied yet. This is due to the fact that some of them are not available at the moment. It seems to me it might be easier to update the SP in total than applying all the notes and the dependencies. Source object is a data source. Target is a InfoSource, which will end up in a DSO. I got the same results with an ADSO and a DSO as direct (or indirect via InfoSource) target object. Request: Determine the last day of the previous month for a given calmonth. My question is, does “read from master data” always force the processing in HANA or is there a workaround to bring the processing back to the application server? “Read Master Data” doesn’t force a Push-Down! How do you comes to this assumption? Can you please create an incident and send the incident number to my mail? great to hear this. It is said in the run time status of the transformation and even adding a dummy routine will not change this behaviour in our system. Yes, I plan to raise an incident but as u know the support wants to see some actions from our side. I´ll send u the incident number by mail. many thanks for your great help in sorting out what is wrong in our system. Your advise with note 2416745 fixed the issue. Never had such a great support in 20 years SAP. My reply is not relevant to this discussion but can you please guide me below to the requirement. Currently I am trnasforming existing ABAP logic to AMDP Script in my Bw4HANA sandbox.What is the best way to append rows for outtab in BW trannsformations ? Is it with Union/Union All or Insert .I know DML operations are not allowed inside the procedure ? What do you recommend ? I used Union as well as Union All and it took almost 19 minutes to process one record.Bascially we want to popullate future fiscal buckets. For example A document D1 has Period 2018 001 with Credit 100 and Debit 0 .We want to populate it as below.My AMDP script is working but in my testing it took almost 20 minutes to process one record.Below is the sample output and the corresponding logic in AMDP script. METHOD GLOBAL_END BY DATABASE PROCEDURE FOR HDB LANGUAGE SQLSCRIPT options read-only. without data it’s quite difficult to analyze the code. In case of an huge :intab we do not recommend imperative programming logic. I’m not sure it is possible to re-implement the coding in a declarative way?!?! Otherwise, if the ABAP implementation works, keep it in ABAP. Sorry for the late reply ,I have corrected my AMDP script it’s working fine now. As a HANA executed AMDP transformation does not support DTP semantic groups, is there any possible way to ensure that all data related to the key field (say, one customer) are in the same package? Appreciate your help and suggestion for this. I guess that’s not the answer you wants to hear. Seriously, in BW 7.50 you can only ensure that all data related to a semantic key are delivered in the same package if you adjust the package size so huge that all data are delivered in one package. So if semantic grouping is important and you need it for your logic I would recommend to implement the logic in ABAP. An other alternative way is to switch to BW/4. Sorry that I can not provide a better answer. No worries, thanks for the suggestion. I actually tried a way in the AMDP code to backward lookup from the source DSO all data related to the semantic key to be delivered in the same package. But this is definitely not the right way, it gives memory allocation issue with usual DTP package size of 1 million to execute on HANA. Reducing the DTP package size to 50k enables the load to complete but doesn’t help to leverage the HANA benefits of shorter load runtime. So as you said, maybe the better way would be to implement the logic in ABAP. (2) I could’nt help notice that your blogs included chapter-numberings, starting with 1 through 4 (750 SP4 changes) and the blog on the recommendations continues with a “9” numbering. Any plans on your part on putting up chapters 5 – 8 ? (3) In addition to the PDEBWP material sevaral colleagues were using the SAPPress book on ABAP in BW by (your former?) colleague Dirk Herzog (never heard from him or seen him around here for several years). It would be really great to have something like that up to date in the BW on HANA / BW/4HANA context – are there any plans for such a book by yourself or anyone at SAP? (1) yes you’re right the course based on BW 7.0 which is quite stable (or somebody says old ;-} ). But the most technical concepts which are covered within the course (like generic DataSources, Customer Exits and BAdIs) are still the same. There are some changes like in the reporting where we switched from an Exit to an BAdI, but the technical fundamentals are the same. So if you are running a BW7.4 or 7.5 the course is nevertheless usefully. Waht is currently is not covered within the course PDEBWP is SQLScript (also called AMDP Routines). (2) The blog series based on an internal document. I must prepare each chapter into an external format (regarding the content). That needs time and I’d focused on these parts where we get the most questions. May be the AMDP course provides the information you are looking for. I’d seen the course material and there are a lot of usefully topics around SQLScrips are covered within the course. When will this new course will be available outside Germany or in English? Speaking of, what about extractors? We use CDS view whenever possible, but that doesn’t cover the complicated custom extractors (which we have a lot since Business Content doesn’t deliver the things we need). Since there is still no alternative, we still use the RSAX framework. Are there any possibilities to write AMDP based extractors and if so, how can this be achieved? If not, what are the alternatives? I’m not longer deep involved in the course creation and maintenance process. Meaning that in the case where 0LOGSYS is used a push-down to HANA should be possible, right? At least it has been on BW/4 SP05. Has there been any change between this SP and BW/4 SP08. Because at least in our systems we get an error in this case. We have seen the note https://launchpad.support.sap.com/#/notes/2488774 but it seems to solely apply to constant assignment. yes for this two InfoObjects we’d implemented a special logic. That means the logic from the ABAP program is covered within the generated HANA runtime object. Currently there is an issue regarding the HANA execution check within the frontend. This issue will be fixed with Patch 03 (version 1.19) of BWMT – for further information on the release schedule please check the attached note 1944835 – SAP BW Modeling Tools – Delivery Schedule. That means it could be happen that you get an error regarding the HANA runtime check if you are using one of this two InfoObjects within a transforamtion. thanks for your quick answer. Then we are going to wait for Patch 03.
we are running BW on HANA 7.5 SP11. I have installed BMT 1.19.30 (which corresponds to 1.19 patch 04 if I understand it well from the release notes. I just tried reactivating a transformation based on a Calculation View as a source, and still get the error that the transfer routine for 0SOURSYSTEM is not supported. Thanks for this amazing blog series. I didn’t find anything regarding the possibility of accesing HANA views in AMDP. I didn’t find any problem when accesing External HANA Views from BW objects but I’m receiving an error when activating an AMDP routine accessing data through a CV with calculated attributes. I couldn’t find anything in OSS. Do you know if there are restrictions on this? what does the error message tell us? Can you post the message here? can you create an incident for this? And let me know the incident number. After implementing the notes for AMDP transformations error has been corrected and we have been able to activate the transformation. Thanks for your support and kind regards. Thanks for all your blogs related to BW HANA. Quick question, is there a abap program like RSDG_TRFN_ACTIVATE to activate a transformation between 2 ADSO in the production system, if the transformation transported has not been activate during the transport. why you can not use the report RSDG_TRFN_ACTIVATE? Do you know why the transport (after import) does not activate the transformation? any error messages within the log? I have an aDSO (with 500+ mio data records) with SID generation switched on for an InfoObject. I’ve created an Expert Routine with AMDP script and added the logic here. But when executing the DTP the system throws an error that there’s an invalid colum name: see the screenshot below. I also tried to add the SID field to the OUTTAB etc., but wihtout success. If I remove the SID generation for the InfoObject, the DTP can be executed successfully and provides the correct data. Does the AMDP has some issues with the SID generation or is the SID generation obsolete? I couldn’t find any hints for this. are implemented in the latest version. In case the error is still present please create an incident. Which BW Version / Release /SP you are running? We’re on BW 7.50 SP06. I implemented the latest version of the report Z_SAP_BW_NOTE_ANALYZER as requested in 2603241 and realized we’re far away from having all the listed notes. In the aDSO the SID was added to the DataStore. After removing the SID, I was able to complete the AMDP script whithout issues. But with the added SID in the DataStore, I didn’t found a way to make the AMDP running because I couldn’t add the SID column to the OUTTAB. So the question is, how can this be treatened? the SID column should be filled by the transformation / DTP without further action from you. In my case I have Composite provider as a source of AMDP Transformation. While loading data it tries to process all packages in ONE go and dumps due to memory overflow. Is there any way I can avoid this? that a very less information. What Release / SP you are running? What do you mean with AMDP Transformation? I assume a HANA processing transformation with at least one AMDP routine. Which routine? Depending on the release we’d added a Breakpoint option to generate a PlanViz to analyse where the memory allocation is very high. Do you checked this option already? Is the CompositeProvider based on only ADSO or you are also using CaclViews inside the CompositeProvider?